The SRW is the smallest of the three MyBus models, seats 14 passengers and does not require a commercial vehicle license in many states. Professionals at Thomas Built Buses, High Point, NC, a subsidiary of Daimler Trucks North America, spent the last twelve months cultivating a new business venture from the germination of an idea to the full construction of MyBus, the company’s latest addition to its line up. Designed for simplicity, safety and style, Thomas Built plans to position this new multi-function student activity bus (MFSAB) as the solution for small organizations that frequently move people but are not in the people-moving business, such as childcare centers, churches and community organizations. The niche has always existed in the transportation market. But Bob West, MyBus product manager, says the unique needs of these clients were not being fully met and the opportunity was too ripe to ignore. 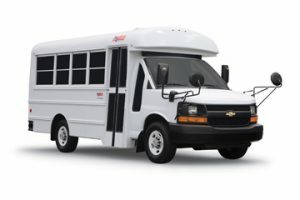 Building on its successful Minotour model—a Type A vehicle designed primarily for the school bus market—the company analyzed the niche and responded with MyBus. John O’Leary, president and CEO of Thomas Built Buses, says non-traditional small bus customers such as youth groups, YMCAs and daycare centers are likely MyBus customers. The SRW is the same width as a passenger van for around-town trips and seats up to 14 passengers, which does not require a commercial vehicle license in many states. The DRW 041 has dual rear wheels, room for 20 passengers and optional coach seating. The DRW 051 has dual rear wheels, can seat 30 passengers and also has optional coach seating. All seats meet FMVSS standards and seatbelts are available in all three models. MyBus is simplistic, stylish and easy to drive. Other features include a rear emergency exit door, full-height 73-inch interior head room and a wide center aisle. West says options include overhead luggage racks and storage compartments in the rear of the vehicle. MFSABs must meet the same safety standards as school buses, but do not require a stop arm, traffic control lights or a yellow paint job. O’Leary says year after year studies show that school buses, which include MFSABs, are the safest form of surface transportation available to the public—a prime selling point for MyBus over passenger vans. Part of the MyBus objective is to ensure the product is easy to buy. 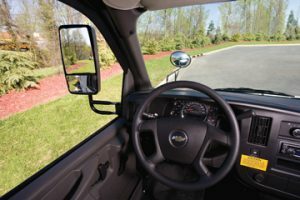 For this reason West says they plan to keep the product in inventory at Thomas dealers nationwide, so that customers can look at the bus one day and drive it off the lot the next day. West says the new line is durable, reliable and easy to repair. Built on a GM chassis, MyBus can receive service at any local GM dealer. The company plans to tout the fact that Thomas Built has dedicated MyBus service professionals in every state and province to maintain the product, as well as an extensive customer service network throughout North America. He says the company conducted a lot of research up front, collecting good input from customers and dealers in the early stages of development. The enthusiasm among employees also helped move the project along quickly. Despite the economic recession, West says Thomas Built is committed to innovation and leadership in the industry and the introduction of MyBus is no exception.